Rachel Pellman always designs the sweetest of wallhangings and this one is no exception. 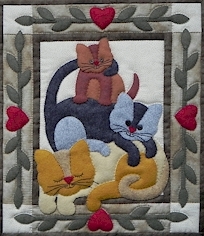 With three kitties resting on top of one another, this lovely design will delight cat lovers everywhere. Hand applique with wool felt. Finished size approximately 13 x 15 inches. Kit includes all of the fabrics, wadding and backing along with the pattern.